I am a (now official) postdoctoral fellow at the University of São Paulo. My main interests are related to how biological interactions affect the diversification dynamics of different groups. I am also interested in how other biotic and abiotic factors affect the diversification of land vertebrates, as well as trying to understand how some groups can achieve a huge species diversity. I am also interested in method development and performance testing. Lastly, I am an open science enthusiast, and want to start blogging about it, general science and my personal interests in the near future. My second paper was published in Systematic Biology! Our paper was published today on the cover of Proceedings B. The video from my talk at the Evolution meeting in Portland is online! An increase in ecological opportunities, either through changes in the environment or acquisition of new traits, is frequently associated with an increase in species and morphological diversification. However, it is possible that certain ecological settings might prevent lineages from diversifying. 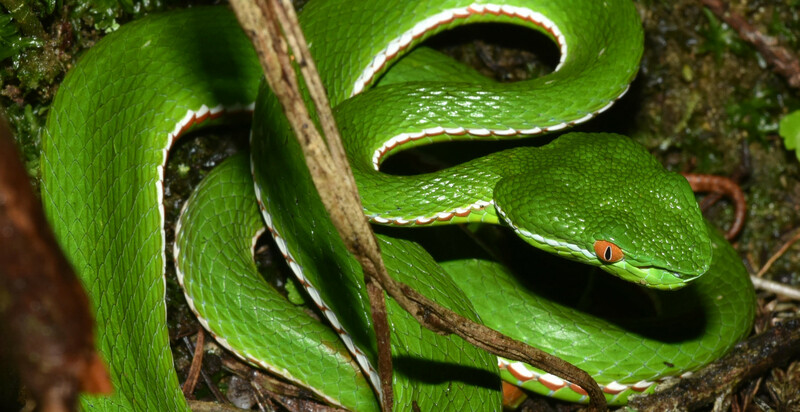 Arboreality evolved multiple times in vipers, making them ideal organisms for exploring how potentially new ecological opportunities affect their morphology and speciation regimes. Arboreal snakes are frequently suggested to have a very specialized morphology, and being too large, too small, too heavy, or having short tails might be challenging for them. Using trait-evolution models, we show that arboreal vipers are evolving towards intermediate body sizes, with longer tails and more slender bodies than terrestrial vipers. Arboreality strongly constrains body size and circumference evolution in vipers, while terrestrial lineages are evolving towards a broader range of morphological variants. Trait-dependent diversification models, however, suggest similar speciation rates between microhabitats. 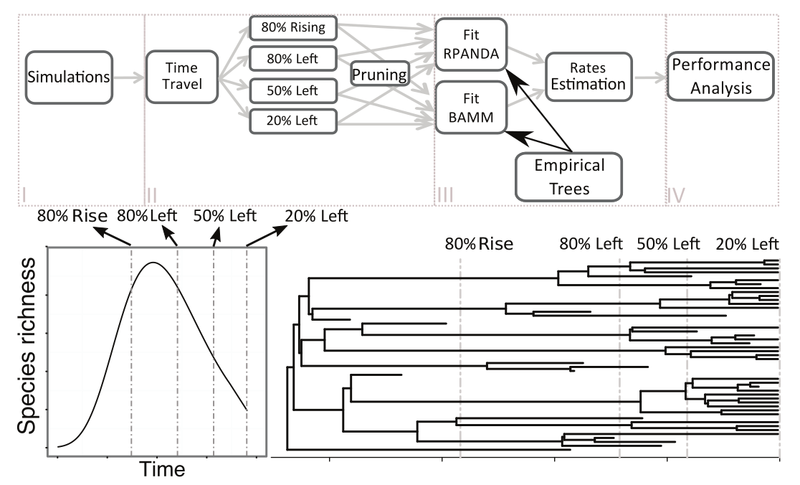 Thus, we show that arboreality might constrain morphological evolution but not necessarily affect the rates at which lineages generate new species. In Proc R Soc B, 2017. Diet is commonly assumed to affect the evolution of species, but few studies have directly tested its effect at macroevolutionary scales. Here we use Bayesian models of trait-dependent diversification and a comprehensive dietary database of all birds worldwide to assess speciation and extinction dynamics of avian dietary guilds (carnivores, frugivores, granivores, herbivores, insectivores, nectarivores, omnivores and piscivores). Our results suggest that omnivory is associated with higher extinction rates and lower speciation rates than other guilds, and that overall net diversification is negative. Trait-dependent models, dietary similarity and network analyses show that transitions into omnivory occur at higher rates than into any other guild. We suggest that omnivory acts as macroevolutionary sink, where its ephemeral nature is retrieved through transitions from other guilds rather than from omnivore speciation. We propose that these dynamics result from competition within and among dietary guilds, influenced by the deep-time availability and predictability of food resources. The tutorials that we used during the course are avaliable here (in portuguese). I will upload the slides from the classes soon.